16 May 2015 - Whose Boots and Where? Red Paper Bridge at Grisedale. Click here & then scroll down to get the bigger picture. The family dog, Alfie, which went missing on Wednesday the 25th February around Trough Head near Patterdale was found on Sunday morning the 1st March. Thanks to all who helped to search for him. A family dog, Alfie, went missing on Wednesday the 25th February around Trough Head near Patterdale. He is a standard Salt and Pepper Schnauzer, wearing a Red waterproof coat. He wears a purple Wainwrights walks collar. He does wear a tag on his collar with name, address and telephone number on it and is microchipped. He has an extra claw on one of his front paws and a long curled tail (isn't docked). If you spot him or have any information please call 07850266549. 1 Jan 2015 - New Year's Day Swim/Dip in Ullswater! Congratulations to all the swimmers who braved the cold (and rain) and raised £120 for Public Hall Funds. Thanks to the spectators for their support and contributions, and thanks to the Steamers for the hot drinks and mince pies to warm up the swimmers afterwards. There was so much news and information generated during this campaign that it would overwhelm this news archive. In order to preserve the information, we have decided to archive it in a dedicated page on this site, which can be accessed via this link or from the site index. Dotty is a young dog, and went missing the 25th November above Hartsop. The weather soon afterwards was appalling and if she was still up there, she must have been terrified, cold, hungry and bewildered. If you have seen Dotty, or taken her home, to a vet or to a rescue centre, please call 01539443313 or 07824717370. Her FaceBook page is #FindDotty. Paul Neate was surprised to find this Robin nesting amongst his waterproofs in the porch of his house. Robins have been known to nest in unusual places such as car engines and watering cans. Let's hope that Paul doesn't need his waterproofs during the next few weeks. 19 Apr 2014 - Dog Lost at Hartsop; Now Found! 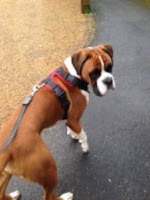 A Boxer dog named Murphy, lost on April 14th in the Hartsop area while out walking, was found on Saturday, April 19th, after a helicopter searched the area. Murphy was seen from the helicopter on its second sweep over the fells. Murphy has lost weight and has a cut on his back paw - other than that is fine. Click here to learn more about how Murphy was found. The Revd Terry Wilcock was successfully inducted as Vicar of St Patrick's by the Bishop of Penrith on Sunday February 23rd at St Patrick's Church. Some of the swimmers and spectators who braved the cold for the New Year's Day swim. Thanks to the steamers for hot drinks & mince pies afterwards in the pier-house and thanks to all who gave to the collection - £70 raised in aid of public hall funds. 9 Oct 2013 -Patterdale Terrier Lost On High Street Now Found! This black Patterdale Terrier called Rob was lost on High Street above Ullswater on Saturday October 5th. There were notices all around and on Patterdale Today asking for anyone who saw him to get in touch with the owner. The great news is that he was picked up on High Street on October 9th by some walkers and is now safely reunited with his owner. Congratulations to the litter pickers - a full skips worth of litter was collected from the Ullswater shoreline. Patterdale Today, which is now in its 7th year, has been updated. In order to maintain our focus as an up-to-date local information website, the editorial team meet each year to review the usage and content of the site. We have discontinued some features and pages that were seldom visited and, in response to some complaints and advice about content over which we had no editorial control (for which we could be held liable) some content has been removed. The Home Page, which we all try to keep up-to-date, is very popular with over 25 visits each day. The What’s On page is equally popular, particularly as we have now extended the range, so please continue to send us details of any events, concerts, meetings etc. Recognition for its beauty in a National Newspaper. The King George V Playing Field was mentioned and highly recommended for a visit in the Travel Supplement of The Sunday Times on the 30th June 2013 - they also referred readers to Patterdale TODAY. The grounds have recently undergone drainage works to prevent flooding which will hopefully benefit the sports activities and car parking. Thanks to everyone who supported the "Coffee and Cake" fundraiser for our local Community First Responders on Sunday, June 23rd. The event raised £750 for purchasing additional equipment for the team. The First Responders are hugely grateful to all those who were so generous in giving cakes and raffle prizes, and to those who came on the day and made it such a successful event. The first and hopefully not the last, Cumbria Challenge raised an amazing £153,000 for the Walking with The Wounded Charity. Distant Horizons a Watermillock based company whom The King George V Playing Field Committee have worked with before, organised the event and used the field at Patterdale as the control centre and the start and finish for the race. 74 teams of 4 people braved the harsh conditions on the day. The courses were either a 20km or a tougher 33km route . All got home, some with only minor bumps and scrapes and no emergency call-outs necessary. Given the weather conditions this was an achievement in itself and a testimony to the good preparation by the walkers and the organisers There was a lot of support shown by the local residents in helping with staffing and preparation and it was always the organisers intention to involve as many local people and businesses in the participation. Feedback from the Parish so far has been positive with a much needed uplift in business. The Co Founder of Walking With the Wounded, Ed Parker, personally thanked the KGV Committee and the residents of Patterdale for their warm hospitality and assistance and stated he was most looking forward to next years event. Congratulations to everyone involved in the recent fundraiser at the Public Hall. The sales of tea, coffee and the wonderful cakes made £1120 for the Air Ambulance Service. Police warning - there have been thefts from beauty spot car parks in the Ullswater area over the last couple of days. Please keep items out of sight in the boot. Please transfer items to the boot BEFORE you arrive at the car park or other location where you are parking. It would appear visitors using vehicles are being watched by thieves and their vehicles targeted once they have left the area. Please report any suspicious activity to Cumbria Police on ‘101’. The contract for the Connecting Cumbria broadband project was signed in Glenridding on Nov 29th . Pictured above at the steamer pier are Liz Mallinson (Cumbria County Council), Bill Murphy (BT) and Rory Stewart. Click here to read the full press release. An earthquake with a magnitude of 2.1 and a depth of 7 km hit Patterdale at 9:37pm on Wednesday, November 28th. For a full news report, click here. Citizens Advice have established a Northern Debt Advice Line for people living in the North East and Cumbria. The advice line is staffed by specialist debt advisers who provide a full debt management and advice service, dealing with all kinds of debt problems . The advice is free, confidential and independent. The advice line is open 9am – 5pm, Monday to Friday; calls from landlines or mobiles are charged at standard local call rates and will be included in any free calls/minutes bundle that you may have. A call-back facility is available. For more information, click here. Following several burglary’s in rural locations, police are advising rural communities to be security conscious and report suspicious activity. The rural areas which have reported burglary’s include Temple Sowerby, Appleby, Pooley Bridge and Stainton. Doors or windows have been forced open with unknown tools to gain entry, during daylight hours when people are out. Small, easy removable items, such as jewellery, laptops and cameras have been targeted. Detective Inspector Furzana Nazir said: “We are investigating all of these burglaries and our aim is to bring those responsible to justice. However, I want to appeal to members of the public, especially those in rural communities to report anything they see which is out of place or suspicious to the police. “People who live in rural areas tend to know who is normally around, the cars or vans they drive and have a general knowledge of day to day business. These people are our eyes and ears; they will know when something is unusual, like a car in the area which they haven’t seen before, driving around taking an interest in the properties but never visiting anyone. Anyone who has any information about these burglaries or if they see anything suspicious in the area, then they can ring Cumbria Police on 101. If you see a crime taking place, dial 999 immediately. Thanks to Ann Burrell and Liz Clarke for this amazing picture. Report from the Cumberland & Westmorland Herald: "Work on creating a “destination hotel” of international renown in the village of Glenridding could begin towards the end of the year after approval was granted by the Lake District National Park Authority — by a single vote. The scheme, put forward by Mr. and Mrs. Charles Graves for the Inn on the Lake, which nestles on the shores of Ullswater, will result in it almost doubling in size to provide across three storeys 32 additional bedrooms, a function suite and a pool, plus a single-storey orangery." Cumbria Fire and Rescue Service are celebrating the opening of a brand new fire station in Patterdale with a ribbon cutting ceremony at 2:30pm on Thursday December 15. The ribbon will be cut by Cumbria County Council’s Chairman, John Woolley and county councillor Gary Strong, Cabinet member for Community Safety and Local Services. Cumbrian firm Border Construction have been working in partnership with Mansell Construction for Balfour Beatty Fire & Rescue to build the new station which has been built on the site of the existing station. The station now has enhanced training facilities, accommodating the changing needs and modern practices of the service. It is now thought that Patterdale blob could be the indigestible jelly of frog spawn regurgitated by predators that have consumed frogs. It is known that the spawn begins to form inside the frogs in autumn although the eggs themselves don’t develop until later in the winter. In the past, it seems that similar blobs have been seen later in the year with black egg dots. Ullswater Nursery was inspected recently by Ofsted and attained ‘OUTSTANDING’ in every single area of the inspection. All this week the Eurozone was in crisis, but national newspapers, TV and radio rightly focussed on the discovery of Patterdale blob, otherwise known as alien goo. It was all started by Tom and Gillian at Patterdale Post Office, and the story took off when Rob, our local blogger, took up the story. To learn more about the mystery of the Patterdale blob, click here. Eden District Council confirmed at its meeting on September 29th that the public toilets in Glenridding and Patterdale will remain open. Closure had been threatened earlier this year, but the toilets have been reprieved following a vigorous campaign by local residents, businesses and our parish and district councillors. The £940,000 project to connect up to 35 homes to the mains sewer system is expected to start this autumn and be completed in Spring 2012, ahead of the tourist season. "We want to build a new public sewer to give homes and businesses who currently deal with their own waste the option of letting us take it away and do it for them," explained project co-ordinator Mark Clinton. "Our new pipe will connect houses in Greenside Road to the sewer system in central Glenridding so that their waste is taken for full treatment before it is returned clean to the local watercourse. It will be great news for the environment and hopefully ease the strain on householders as well." Engineers hope to build most of the 700mm pipe in fields, but there may be some disruption in Browfield Close and Greenside Road where it crosses the roadway. Eden District Councillor Sydney Simpson told the Patterdale Parish Council meeting on June 30th that the threat to close the Public Toilets was receding.This has now been confirmed by reassurance from Gordon Nicholson, the Eden District Council Leader, who says " We understand how much our communities value the provision of public toilets in rural areas and how important they are for the local tourism driven economy... at the 29 September Council meeting, I am very hopeful that we will be able to formally announce the retention of the toilets in rural areas". The Patterdale Triathlon Club is a new local group open to all. All keen cyclists, runners and swimmers in and around Patterdale, Cumbria. The club is for fun, training and competing at an amateur level. Seven candidates stood for the seven seats on the Patterdale Parish Council , and the seven have now been declared elected unopposed. Our "magnificent seven" are Eddie Allen, Gillian Beggs, Martin Butcher, Judith Cooke, Michelle Edgar, Karla Holleis and Steve Sykes. For full details of Uncontested Election Results for Parish Elections in the Eden District, click here. Supporters and friends of the Glenridding Sailing Centre gathered on Saturday, March 12th for the grand opening of the new cabin on the Spit. The rebuilt Pooley Bridge Pier reopened on Saturday, 16th October following a 6 week closure for reconstruction. The pier needed repair following flood damage last November and the decision was taken to replace the damaged structure with a new pier. During the closure Ullswater Steamers have been calling at Glenridding and Howtown only. A full service for this time of year between Glenridding, Howtown and Pooley Bridge is now back in operation. Eden District Council is proposing to stop funding the Council-run public toilets in Glenridding and Patterdale as part of a package of proposed reductions in services to help meet an overall £1.1M savings target. The public toilets under threat are those on the road to the Steamer Pier in Glenridding, and those behind the White Lion car park in Patterdale. These proposals will be considered by the Council at it's meeting on November 25th, and a final decision is due to be taken at the Council meeting on February 10th. The Council say that "Affected groups and organisations have been contacted individually to inform them of the proposals." Ullswater Steamers are running a temporary timetable from 31st August until mid October while essential repair work is carried out on the Pooley Bridge Pier. During this period boats will operate between Glenridding and Howtown only. Patterdale Mountain Rescue Team were called out by the Police at 22.33 to search for a missing person who was walking the Coast to Coast route from Patterdale to Shap. The man from Belfast was walking with his sister, but they had split up earlier in the morning and the woman had returned to Patterdale. The woman became concerned later that evening as the man had not turned up at their booked accommodation in Shap. Following the Police call, the Team search managers met and formed a search strategy. However as the team was beginning to assemble, information was received from the Police that the man had eventually turned up, safe and well, at a different accommodation venue. We have had heavy snow fall on the fells around the Dale in the last 3 weeks - good weather for skiers - click here to see some dramatic pictures. Heavy snow has fallen in the Dale over the last 3 weeks, with a long spell of below freezing temperatures - good weather for photographers - click here to see the pictures. Prince William visited the Ullswater area to meet up with three charities supported by The Princes' Charities Forum. After arriving by helicopter, he climbed Hellvellyn with youngsters from Centrepoint in Newcastle, guided by members of the local Mountain Rescue Teams. Later he took a trip in the PMRT rescue boat from which he boarded the steamer to meet with families who are looked after by WellChild, the national charity for children with serious illnesses. Click on the arrow to watch a 4min video of the day. A warm welcome is extended to Steve Sykes who was recently co-opted onto the Parish Council. This means that the Council now has the full complement of 7 Parish Councillors. For further information about the Patterdale Parish Council, click here. On the 19th January, John Gay was running on the fells with his two dogs Dot and Dash. There was a lot of snow about and cornices had formed on the ridges. Unfortunately, the dogs fell through a cornice above Brown Cove. Dot somehow was able to get back but there was no sign of Dash. Eventually, John had no choice but to return home. After a sleepless night, John returned the next morning, and on subsequent days with more help, to search for Dash but with no success. Twelve days later, when John and Jean were just beginning to come to terms with the loss of Dash, they got a phone call from Ambleside Police asking them to come and collect their dog! It seems that a walker on Helvellyn had come across the dog and realised that there was something wrong. He took the dog down the mountain and into Ambleside. John and Jean send thanks for all those helpful calls and searches to find Dash. He was very skinny when found but otherwise in good health.